Have you shopped your own closet lately? PS. Have you entered to win a monogrammed shirt of your choice? Go here to do it! you're adorable! purple and yellow is one of my favorite color combinations. and you wear it so well! those two colors are so cute together! I need to go shopping so that I can then shop my closet. 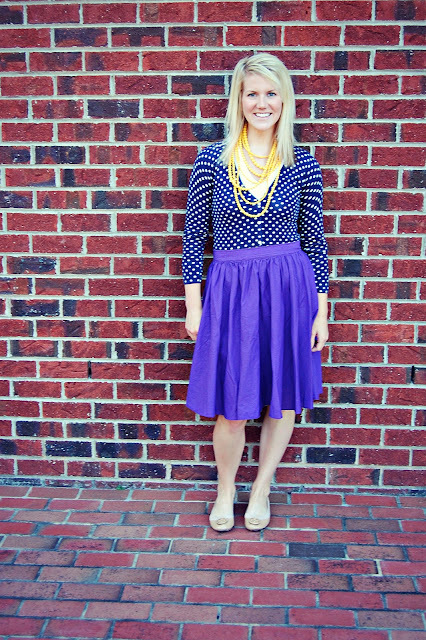 Love this outfit, the yellow necklace is the perfect pop of color! The polka dots are adorable and these colors are so nice and cheerful! $18 for J.Crew is amazing! I love it! I have a hard time shopping my closet - I really need to be better at it! Love that skirt and love deals and finds like that! I have a couple items I scored on clearance and wear them all the time, great investments for not much money! that purple skirt! so awesome, and only $18?! thats such a steal! I seriously love your style Ashley! love the polka dots! you look so pretty! xO! Super cute! I totally want your closet because you always have great outfits on! You look so cute! I LOVE the polka dot top and that yellow necklace is the perfect accessory! It's a great skirt! And what a score for a Jcrew label! Love the color and you'll get a lot of wear out of it. I need help shopping my closet! Adding some new freshness with new combos would be a mood lifter! Oh I love all that color!! So bright and fresh! I need to work on adding more color to my wardrobe...I even had a cashier recently tell me while I was checking out "you wear a lot of black"! I really love the necklace with this! you look great! i love the polka dot top. the necklace is the perfect pop of color! you look adorable!! Everything just pops out from the brick! Awesome background! And how did you find anything at j crew for under a whole paycheck? Total score! Love that skirt- what a great find!! I love a great deal. Love your blog!! Cute skirt. It looks comfy. I love when that happens - some of my favourite items of clothing were just something I picked up and now I wear them weekly. Half of the things you put together I would never think to wear, but they look so good!! Man! What an amazing deal!!!! The yellow necklace with the purple shirt...DIVINE! super cute outfit! love the pop of yellow the necklace brings. OMG! Love it! The whole outfit top to bottom!! p.s. are you going to the trifabb event next week? I love this outfit - it's so fun!! Hi Ashley! I love J.Crew and that skirt is awesome. I can see why you would wear it all the time. I'm a new follower. Ash-you are soo cute! That skirt was such a find-soo gorgeous on you! Great color too! Love that pop of color you get with adding the necklace! Great color combo! You have such a super cute fam and an adorable style! I've just starting shopping my own closet and I can't believe how many new outfits I have lol! Stopping by from for lauren and lauren! 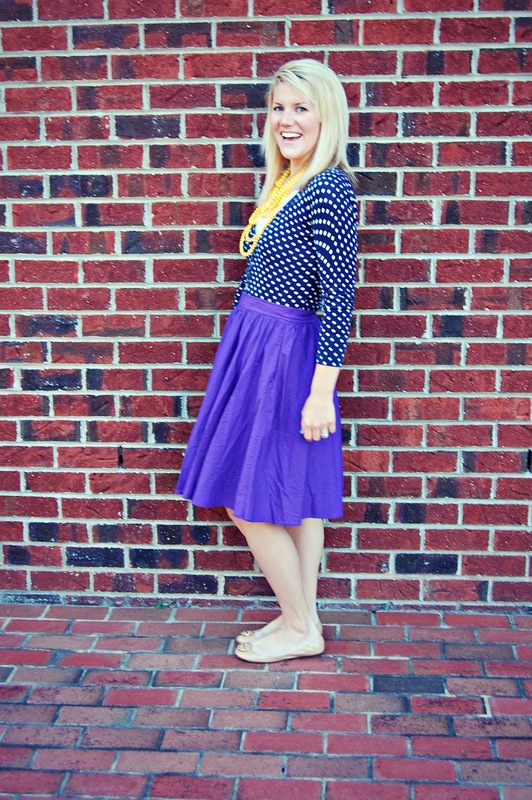 Lovely purple skirt, and what a great deal! Looks great paired with the yellow necklace. Nice brick background. Hope you're having a great day! I love your polka dot shirt! So pretty! wow this is absolutely stunning! the color is gorgeous on you! that skirt is SO fun! i love the bright color! Anything at Jcrew for $18 is a steal. Dang girl, that's an awesome find! You are beautiful! I wish I was that stylish! Newest follower!